There is a lot of tango going on in August in our neck of the woods. Here is a quick round-up with links so you can get all the details on each activity. NEW tango class and dance in Burlington on August 2, 16 and 30. We have been invited to teach at the Burlington Social Club on three Friday nights in August. The lessons start at 7:30pm and are free with entry to the dance; the cost for the dance is $13 p.p. The lessons are designed for those with no experience with Argentine tango. There will be some 2 song tandas of Argentine tango music throughout the dance so that you can practice your new steps. The Burlington Social club is located here. 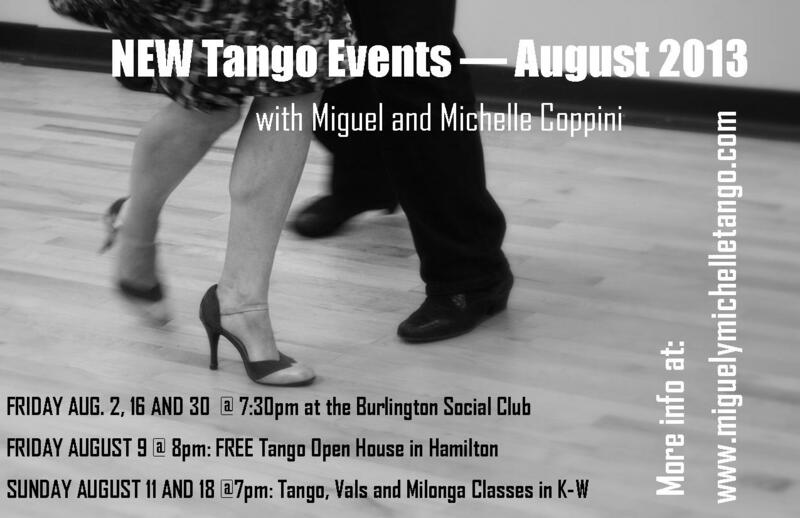 OPEN HOUSE on Friday, August 9 @8pm: You are cordially invited to celebrate another wonderful year of Argentine tango in Hamilton at our new home, the Ballroom on Wellington. This is a free event and everyone is welcome. There will be dancing, refreshments, demos and a free introductory class. Bring a friend, neighbour or reluctant significant other! Check out all the details, including directions to the studio here. NEW session of Tango, Vals and Milonga Classes in K-W start Sunday, August 11 from 7 to 9pm. These exciting classes will inspire you to dance with more confidence and creativity in all three of the tango rythms: tango, vals and milonga. This session starts August 11 and continues until Thanksgiving. More information can be found here. REGULAR Tango classes continue throughout the summer in Hamilton and Toronto. New sessions at the beginner/advanced beginner level begin Wednesday, August 7 and at the intermediate level starts Monday, August 19. Both classes start at 7pm and are 75 minutes long. We will have an intermediate class on Monday, August 5. Join us in Toronto on Thursdays at 8:15pm at the Swansea Town Hall and on Saturdays at 8pm at the Palermo Tango Club (in the Joy of Dance studio).